Can Sega rekindle the old monkey magic on PlayStation Vita? 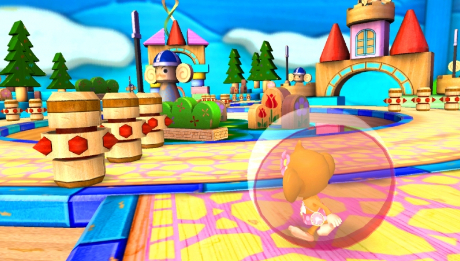 Super Monkey Ball was a welcome surprise during the GameCube launch, circa 2001. Since that time, Sega has released a new game in the series on just about every platform since, and something has been lost with each new entry, save for Super Monkey Ball 2: Sakura Edition for iOS, which was quite impressive. You can chalk up this inconsistency to the publisher dreaming up different ways to reinvent the franchise. Suffice to say, the new Super Monkey Ball: Banana Splitz for PlayStation Vita excels when it heads back to the basics of guiding a tiny primate encased within a sphere through numerous obstacle courses. The gimmicky nonsense, as expected, cheapens the product. To that end, if all you want are those aforementioned and traditional Monkey Ball stages, the game delivers. It contains well over 100 puzzles, each one progressively more difficult than the next. You can play with the left analog stick or tilt, each control scheme offering spot on maneuvering through a variety of tricky boards, where the developers tempt you with a bunch of bright yellow bananas to collect in some hard-to-reach places. On top of that, Monkey Ball hasn't looked this good in years, with bright, rich colors made possible with the Vita's impressive hardware. It's therefore a shame that the game's second half diminishes the appeal. Sega busied itself with concocting a host of party games that make use of the Vita's abilities, things like the touch screen and camera, the latter of which lets you create custom stages by taking photos, the end product simply failing to sizzle. As for the games, Monkey Bowling's reliance on tilt doesn't necessarily make it better, and the once entertaining Monkey Target pales in comparison to past iterations. Other games, ones that involve a strange take on billiards and another forcing users to search for things, again with the camera, left us unimpressed. Throw in one of the more sterile and lifeless (borderline lazy) menus we've seen, and Super Monkey Ball: Banana Splitz is a confusing product, a Jekyll and Hide mix of salty and sweet that only delivers the goods 50 percent of the time. Of course, if all you care about are the levels, you'll likely go bananas over those. Just remember, that iPhone and iPad game costs $2.99, compared to $29.99. What's Hot: Over 100 quality Monkey Ball levels, vibrant graphics, adorable cartoon monkeys. What's Not: Gimmicky party games, unimpressive creation tool.